This ocean themed bathroom canvas wall art is the perfect addition to your child's bathroom! It provides a great reminder for them, and looks cute hanging in their bathroom! 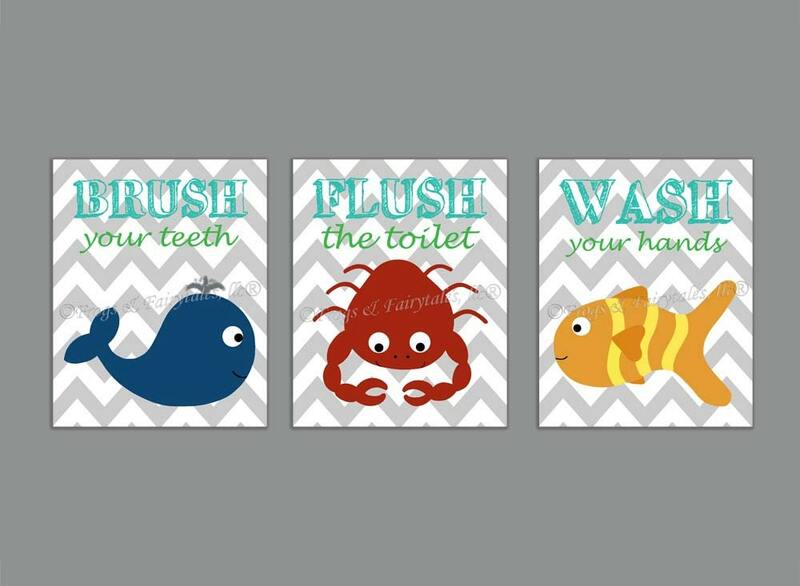 This set includes a whale with the words "Brush your teeth", a crab with the words "Flush the toilet", and a fish with the words "Wash your hands." They have a gray and white chevron background. Watermarks will not appear on your prints. This set comes with 3 gallery wrapped canvas prints, in the size you select from the drop down menu(i.e.-if you select 8"x10", you will receive 3ct. 8"x10" prints). Use the drop down menu to select either the color scheme shown in the listing, or custom colors if you'd prefer a different background pattern or color scheme, or if you'd like the color of the wording and/or the font changed as well. If you choose custom colors, we will message you with a proof to approve before printing.